WELCOME TO OUR ASSESSMENT AND CERTIFICATION DEPARTMENT! TEST YOUR ENGLISH PROFICIENCY AND GET THE SCORE CERTIFICATE. 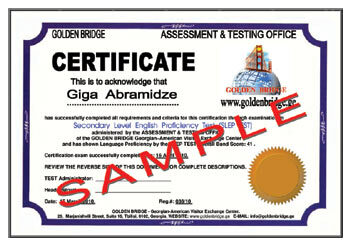 If you are looking to TEST YOUR ENGLISH LANGUAGE SKILLS and GET THE SCORE CERTIFICATE, GOLDEN BRIDGE can help you. The Test is based on the standard American English vocabulary and English grammar that you would find in any English language learning material, so that this proficiency test can measure your command of the English language regardless of your English language learning background. So if you have been learning English, see how well you do! The Secondary Level English Proficiency Test (SLEP) is a secondary level test of English for students whose native language is other than English. The SLEP test is a measure of the ability to understand spoken and written English. The test is used primarily in secondary schools as well as by institutions and other organizations worldwide. The SLEP test contains 150 multiple-choice questions of eight different types. The four types of questions selected for Section 1 of the test all use recorded samples of spoken English to test listening comprehension. The four types of questions in Section 2, which measures vocabulary, grammar, and overall reading comprehension, are based on written and visual materials. 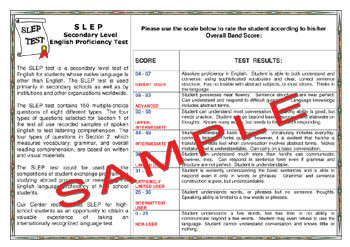 The SLEP test could be used for the competitions of student exchange programs or study programs in high schools or just for measuring the English language proficiency of high school students. Our Center recommends SLEP for high-school students as an opportunity to obtain a valuable experience of taking an internationally recognized language test. SLEP TEST Exam is offered every TUESDAY and TRURSDAY between the hours of 2:00 pm and 4:00 pm. 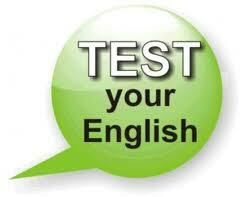 Diagnostic English Language Test (DELT) is a test which measures your English language proficiency. DELT assesses all of your English skills — listening, reading, writing and speaking, and is designed to reflect how you will use English at study, at work, or in your new life abroad. DELT can be taken by any student, undergraduate and graduate, particularly if your first language is not English. However, it is compulsory for Study Abroad and Exchange students. The DELT was designed in accordance with the CEFR - the Common European Framework of Reference for Languages: Learning, Teaching, Assessment. CEFR is a guideline used to describe achievements of learners of foreign languages across EUROPE. It was put together by the COUNCIL OF EUROPE as the main part of the project "Language Learning for European Citizenship" between 1989 and 1996. Its main aim is to provide a method of assessing and teaching which applies to all languages in Europe. 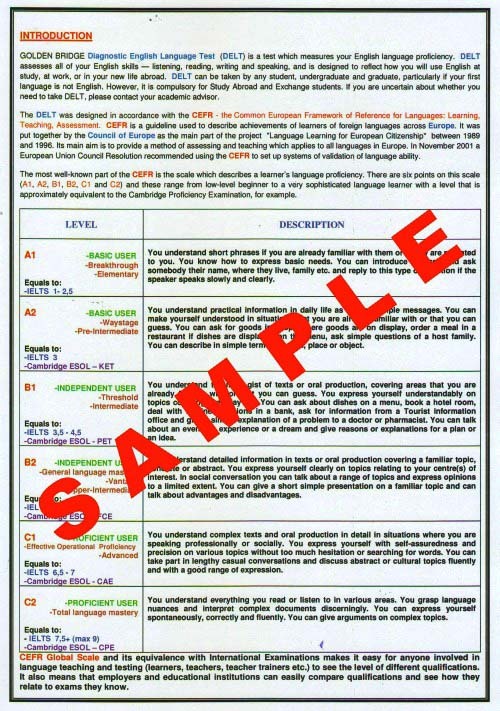 In November 2001 a European Union Council Resolution recommended using the CEFR to set up systems of validation of language ability. The most well-known part of the CEFR is the scale which describes a learner’s language proficiency. There are six points on this scale (A1, A2, B1, B2, C1 and C2) and these range from low-level beginner to a very sophisticated language learner with a level that is approximately equivalent to the Cambridge Proficiency Examination, for example. DELT TEST Exam is offered every TUESDAY and TRURSDAY between the hours of 2:00 pm and 4:00 pm. The SLEP TEST Exam currently costs GEL 190 (Georgian Lari). The DELT TEST Exam currently costs GEL 190 (Georgian Lari). An open door policy is always maintained to anyone seeking information in this office. 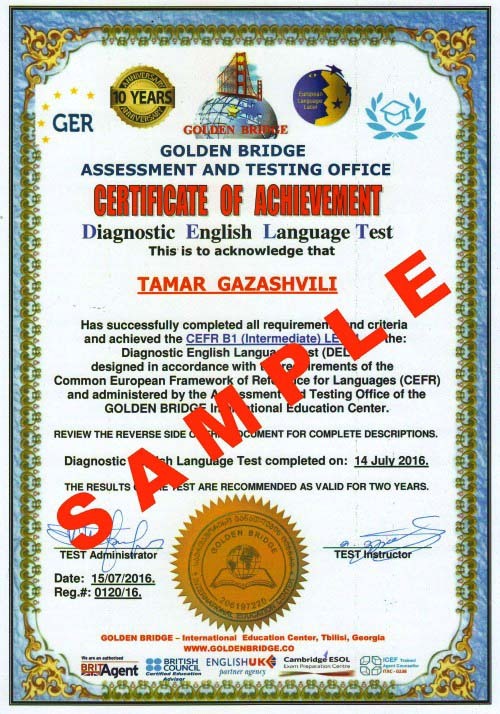 If you are interested in taking an ENGLISH LANGUAGE COURSE at GOLDEN BRIDGE and receiving a SCORE CERTIFICATE you should click HERE.